Teenagers with down syndrome learn to care for animals | Downside UP Ltd.
For the second year in a row, teenagers with down syndrome came to the centre for pet nutrition studies to help their employees in their daily work and, of course, to communicate with its furry inhabitants. The centre contains about a hundred dogs of different breeds; small chihuahuas, a huge Central Asian shepherd dog, poodles, pomeranians and many others. The dogs welcomed the guests with joyful barking! Children were positioned in pairs and went to the work sites under the leadership of skilled experts. 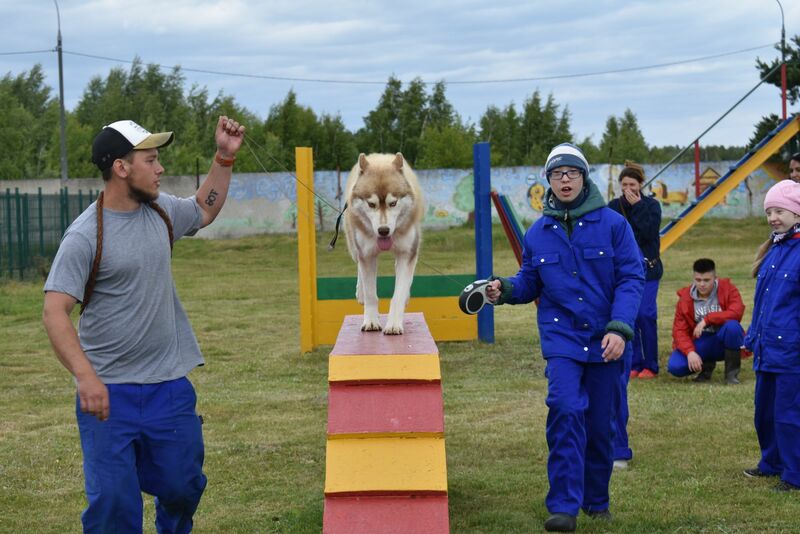 Their duties included the care of the dogs, cleaning of the territory, walking and even basic animal training. Volunteers washed dogs, combed the fur, poured water in jugs, washed the cages and cleaned the area. Then the handlers allowed the children to take the dogs on a leash and ordering them to perform various commands. It is impossible to describe how happy then children looked at this moment! It is difficult to come up with a more effective reward for their voluntary work contribution at the centre. But the guests were in store another surprise: the celebration in honour of the birthday of the dog-symbol of the Centre - a huge good-natured Central Asian shepherd named Yasha, who turned 11 years old. In memory of Yasha photos with the guests were taken and our children drew pictures on the pavement with chalk. To end the day, everybody sat at the table with festive treats.